As we indulge in our favourite Easter eggs these holidays, let’s consider the history of chocolate and how it became such a prominent aspect of our lives. The cacao (or cocoa) tree is native to South America and as early as 3,500 years ago the Olmec Mexican people were using the beans to make a chocolate drink. Throughout the region, powder from dried, ground cacao beans was combined with flavourings such as nutmeg, vanilla and chilli for use in various forms, including drinks. The Mayans of Mexico and Central America identified the drink with the gods and the Aztecs used chocolate in religious rituals, crediting it with spiritual wisdom, high energy and enhanced libido. When Spanish conquistadors invaded Mexico in the 16th century they too enjoyed chocolate and shipped some home, the first known cargo reaching Seville in 1585. The original bitter, peppery cacao drink was more acceptable to western tastes when combined with sugar and cinnamon and during the 1600s it became fashionable among the European aristocracy as a luxury beverage taken in bed in the morning. Rapidly following the first public coffee houses, the earliest dedicated chocolate house opened in London’s Bishopsgate in 1657. The new establishments served a milky, sweet chocolate drink, more expensive than coffee but containing less caffeine, and therefore generally less popular with consumers. 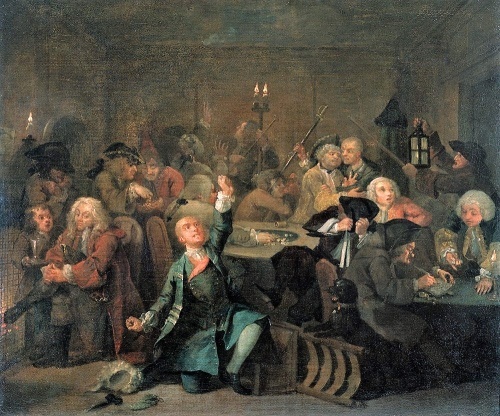 However, chocolate houses thrived as meeting places for wealthy men, the most decadent being White’s in St James’ Square (opened 1693), whose infamous gambling culture was pictured in Scene 6 of William Hogarth’s A Rake’s Progress (1733). Other chocolate houses were also linked to gambling, debauchery, even political rebellion (rebel Jacobites met there) but chocolate retained its elite reputation. Preparing and serving the drink also required special utensils and this inspired the production of exquisite implements and table ware. Eventually, ambitious merchants wishing to expand their trade launched pamphlet campaigns publicising chocolate’s many alleged qualities, from boosting fertility to curing consumption. To increase supply, Britain, France and the Netherlands established cacao plantations in colonies in the Caribbean, Africa’s Ivory Coast and South East Asia, ruthlessly exploiting slave labour. In the early-1800s British abolitionists worked to halt the slave trade: some prominent abolitionists were Quakers who went on to dominate the chocolate industry, like tea, coffee and cocoa dealers William Tuke & Co (associated with Rowntree), who donated £50 to William Wilberforce’s election fund in 1807. Abolitionist chocolate manufacturers refused to buy slave-plantation commodities, but only in the late-1800s did significant quantities of cocoa grown without using slave labour became available. During the 19th century advances in production techniques, cheap labour, improved communications, growing consumerism and lowering prices meant that chocolate, coffee and tea now extended to all social classes. Most ordinary people could now afford these drinks, the temperance movement actively promoting chocolate as a healthy and appetizing alternative to alcohol. However, in Victorian Britain many foodstuffs were routinely adulterated, chocolate containing brick dust and wax often sold by disreputable retailers. Quaker grocers, besides being committed to fairness, equality and social reform, were also renowned for their honesty and reliability and founded the two principal chocolate firms, Cadbury of Birmingham and Rowntree of York. Another major British company, Fry’s of Bristol, developed the first chocolate bar in 1847: made from cocoa powder, sugar and melted cocoa butter extracted from the beans, the mixture was moulded into solid bars and blocks. Initially dark and bitter-tasting, nonetheless this innovation revolutionised the consumption of chocolate and confectionary in general. In 1875 a Swiss chocolate manufacturer, Daniel Peter, added condensed milk to his recipe, making the first milk chocolate bars of pleasing flavour and texture. Further advances produced a smoother, more refined product and superior Swiss milk chocolate dominated the British market for the next quarter of a century. During this time, Cadbury expanded their manufacturing operations and eventually challenged Swiss hegemony by launching their first milk chocolate bars in 1897. Early Cadbury milk chocolate bars were made from milk powder paste, cocoa mass, cocoa butter and sugar, but being coarse-textured and dry, not creamy, weren’t initially a huge hit. However in 1904 George Cadbury Junior was tasked with developing a chocolate bar containing more milk than any other product on the market. Various names were mooted, including ‘Highland Milk’ and ‘Dairy Maid’ but a customer’s daughter suggested ‘Dairy Milk’ and the product with this now-familiar name was launched in 1905. Gradually becoming popular, Dairy Milk chocolate was sold in unwrapped blocks that could be divided up into penny bars and by WW1 it was Cadbury’s most successful line. During the First World War, when servicemen received strict food rations, chocolate provided a delicious respite from the monotonous diet. The British government placed vast orders for Cadbury’s Dairy Milk and Bourneville Cocoa (launched in 1906) for the troops throughout the war, the company itself despatching additional parcels for soldiers, some arriving as welcome Christmas treats. During WW2, with raw materials scarce and manufacturers banned from using fresh milk, Dairy Milk was withdrawn from the shelves in 1941, being replaced with Ration Chocolate made with dried skimmed milk powder. Easter eggs symbolising the start of life originated in pre-Christian times, but the first chocolate Easter eggs appeared only 200 years ago. In the early-1800s French and German confectioners led the new art of making chocolate eggs, some early examples being solid, others hollow, the egg simply wrapped in paper. In Britain Cadbury launched its first chocolate Easter egg in 1875. Early eggs used dark chocolate, had a smooth, plain surface and were filled with sugar-coated chocolate drops or ‘dragees’, but they grew more elaborate, their shells decorated with chocolate piping and marzipan flowers: by 1893 Cadbury’s boasted 19 different Easter egg lines. The successful development of milk chocolate in the early-1900s also boosted the market for chocolate eggs, which became well established as seasonal best-sellers.